Perhaps his biggest idea in creating the change children need is a joint effort with martial artists around the world. 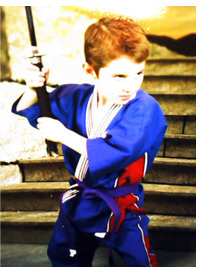 William has been involved in the martial arts most of his life and knows first hand the passion and dedication it takes to become a great athlete. Using those same concepts, William says he’s dedicated to ending malnutrition for every child in need. He’s devised a plan to bring martial artists together to compete in a competition that will benefit children suffering from malnutrition. William calls the competition a “Break-A-Thon” and is working to recruit Champion board breakers to participate. Eventually, William says he wants to have the fundraising Break-A-Thon televised! We whole-heartedly believe that it is passionate kids like William that will bring about change in this world that some of us could have never imagined. William’s right, anyone can make a difference. It makes us proud to see kids like him taking a stand in what they believe in and giving it all they’ve got to help other kids less fortunate. He is well on his way to being a great leader and a major advocate for change.